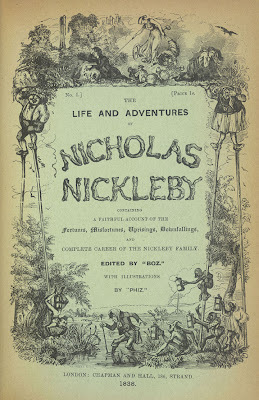 Nicholas Nickleby. I definitely haven't read it. That has now changed. Well, depending. I ear-read it, which is to say I listened to it on audiobook, so you'll have to decide whether I get full credit for "reading" it. I'm a pretty close listener, though. Prognosis: This is not my favorite Dickens. What's missing, though, is the big complex kaleidoscope of a fully realized Dickens plot. In my favorite of the novels, there will be several scores of characters (not the paltry three dozen deployed here!) who are all twined together through an elaborate tangle of circumstance and back-story. In Bleak House or Our Mutual Friend, to pick examples I've had my nose in fairly recently, you'd be hard pressed even to identify a "main character" out of half a dozen legitimate contenders, and three different people could each give you accurate plot synopses without it being obvious that they were talking about the same book. There's just a hell of a lot going on in these full-fledged Dickens masterpieces. Nicholas Nickleby, on the other hand, runs pretty much on a single rail. It's an episodic novel, and the various episodes aren't very well integrated. The best-known bit has our hero Nicholas at a hellish Yorkshire boarding school, the cheerfully named "Dotheboys Hall." Escaping his job there -- he is a teacher, not a student -- he effortlessly and somewhat randomly becomes a minor star in a regional theater company. After the first scenario has been milked for tears and the second for laughs, Nick is headhunted off the London street for his obvious qualities of nobility and intelligence, and made the clerk, protege, and pet project of two saintly and vastly rich wholesalers. Elements of the first two scenarios reappear and are resolved in the within the third, but the construction of the whole is fairly slapdash. The title character is certainly the "main" character, but he is the least fleshed-out person in the book. We know of him that he is smart, capable, kind, and a little volatile, but that's about the extent of his personality. Maybe Dickens intended that we readers would imagine ourselves into his place, but my own feeling was that he was an empty suit whose adventures it was hard to get too worked up about. His incorporation in the theater company, for instance -- we had no previous suggestion that he might have theatrical talent, and he shows no particular interest in things theatrical, so when he is suddenly up there performing on the Portsmouth stage, it feels more like an authorial contrivance than a natural flow of events. Dickens is of course not best known for a relentless pursuit of plausibility, but in his better work the improbabilities are at least the germ of the story -- the remarkable things that make the tale worth telling -- rather than just a clumsy way of keeping the action moving forward. Current Dickens Score: I have now read 7/14.5 of the non-Christmassy Dickens novels. Need a second opinion on Nicholas Nickleby? Sure you do! The blog post from which I helped myself to the title page image is a somewhat more coherent review. As you wend your way through the Dickensian corpus, you may also be interested in Dodger by Terry Pratchett, which is in part inspired by Dickens (and Dickens himself is a major character in the book. I ear-read it not long ago, and found it both fun and well-researched (full disclosure, Pratchett is one of my favorite authors). Ear reading definitely counts. It takes me much longer than when I "eye read" and I find I catch more. Element of the Month: Scandium! Saint of the Month: Saint Barbasceminus! It's (related to) the Book Arts! Element of the Year 2012!! !